One of the many curious things about being a writer—especially a novelist—is the number of people you encounter who believe they could do your job, that the only thing that separates you from them is that you bothered to sit down and write a book, and though they’ve got that bestseller in them, they just haven’t made the time for it yet. That’s not everyone, of course. Some people look at writers as if we’re strange objects behind glass in some museum display that ought to have a plaque to explain our purpose. This isn’t a complaint, mind you. Both reactions are fascinating and sometimes amusing. But I’ll tell you something that’s even more fascinating to me. When it comes to collaborations—two authors writing a novel together—even the just-haven’t-had-time-to-write-my-bestseller crowd seems to get that curious look on their faces, that what’s-that-odd-animal expression that comes over people who encounter the giant South American rodent at the zoo for the first time, the thing that looks like it should only exist in The Princess Bride. Due, presumably, to the fact that I regularly collaborate with other authors, I get that look—and that question—a lot. People really do seem mystified by the idea that two people can create one voice. Actors create a scene together, musicians perform a song together and write music together…but you don’t often seen painters working on the same canvas. Perhaps that’s where people draw the line. Maybe, even subconsciously, a novel is perceived as a solitary work, much like a painting. And I suspect for a lot of writers, that is absolutely true. I suppose many—even most—writers have difficulty imagining creating a piece of fiction that is a shared vision, but it’s simply never been a problem, or even a question, for me. Writing, I am fond of saying, is a solitary occupation, and I am not a solitary person. In the nineteen years since I quit my job (at the tender age of 25) and became a full-time writer, I have collaborated with more than half a dozen different writers, and those experiences share certain fundamental qualities. In each case, my collaborators were my friends first, and they were all writers whose work I respected and admired. Nearly always, they begin with conversations about mutual interests, or drinks and dinner, or a stupid joke on an elevator…something that leads to an idea being born, sometimes in jest, and then a moment when you look at each other, both thinking, hey, that’s not a bad idea. We could really make something out of that. And if it’s something both authors are enthusiastic enough about, then you do it. 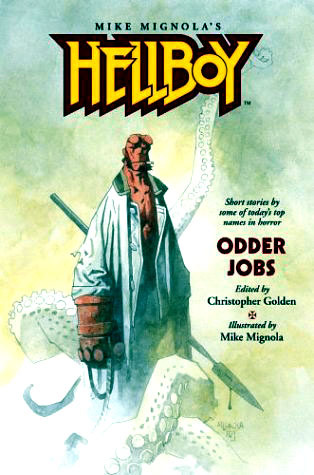 I first met Tim Lebbon via e-mail, when I asked him to contribute a short story to an anthology of Hellboy short stories I was editing called Odder Jobs (Dark Horse, 2004). That, I believe, was in 2003. It feels like we’ve known each other much longer, but we didn’t meet in person until a World Horror Convention in New York City in 2005. 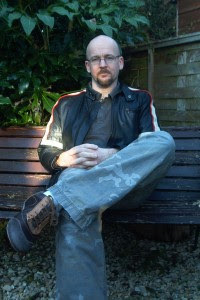 I’d been cooking up the plot for a novel I wanted to write called Mind the Gap (Spectra, 2008), but because it was set in London and very much a British story, it felt to me like something I wanted to collaborate on with a British author. 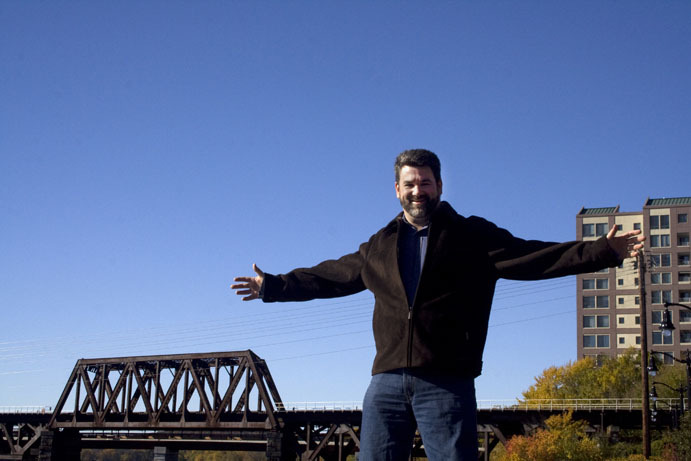 As soon as I met Tim, I felt a kinship with him. We became fast friends and it seemed like serendipity. I told him about the concept for Mind the Gap and he jumped on board immediately. That novel became a series of four loosely connected urban fantasy novels collectively called The Hidden Cities. They are Mind the Gap, The Map of Moments (Spectra, 2009), The Chamber of Ten (Spectra, 2010), and (coming later this year) The Shadow Men. 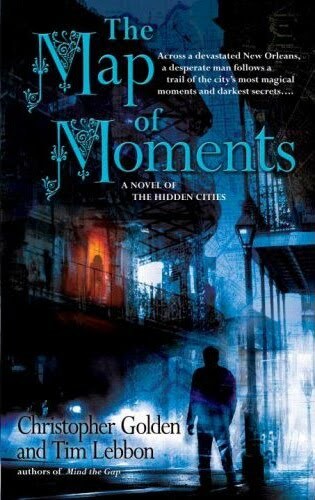 While I’m proud of the work we did on those books, especially The Map of Moments, which I think is one of the finest things either of us has ever written, collaboration or not, those books were born “on purpose,” if that makes sense. We wanted to create ideas, to build stories, all of that. Which brings me around to The Secret Journeys of Jack London (Harper, 2011). Yep. Vampire polar bears. The very thought of it sparked an instant excitement and enthusiasm in me—not necessarily vampire polar bears themselves, but all of the images and ideas that flooded into my brain at that moment. Back up. My father was in the Coast Guard during the Korean War, stationed on Kodiak Island in Alaska. Some of my favorite pictures of him were taken during that time of his life. My parents were divorced when I was eleven, and my father died when I was nineteen. I always wished I could have talked to him more about Alaska. Despite his many flaws, I romanticized Alaska and that part of his life in my mind. Perhaps that’s one of the reasons that Jack London has always been my favorite “classical” writer, from the time I first read “To Build a Fire” and The Call of the Wild (1903) in middle school. Jack London inspired me with tales of the frozen north, with darkness and ice and stories told around fires and rough men in rough terrain and the purity and savagery so perfectly melded in the image of a wolf. In the eighth grade, I wrote a paper called “Atavism in the Works of Jack London.” Fairly certain I got an A. It’s still around here somewhere, if I can only track it down. Another aside. Also in middle school, I used to run across advertisements for some liquor or other in magazines, and the ads would have bits of poetry quoted from the works of Robert Service—all of them about the same sorts of things that were so central to the works of Jack London. The frozen north. Grim and determined men. The wild. Robert Service became my favorite poet. I bought collections of his work. I quoted him in my second novel. Then, about ten years ago, my uncle gave me a packet of letters he’d found that my father had written to his Aunt Marguerite during his time stationed on Kodiak Island. He’d been romancing a girl there, and her father had taken a liking to mine. The man had given my father a book that had become my father’s favorite…a collection of poetry by Robert Service. It’s all wrapped up in one strange cycle for me. Jack London. Robert Service. My father and me. Back to that Thai restaurant in Toronto and someone says vampire polar bears and all of this goes through my head in a single moment. I look at Tim and say something about how we could do that. 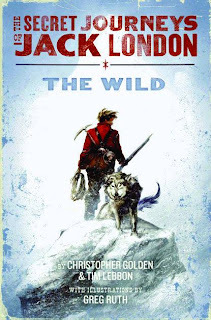 Jack London in the Yukon fighting vampire polar bears. Tim says we could do a whole series of them, a trilogy. I say: The Secret Journeys of Jack London. Because, you see, he loves Jack London, too. He has had the same childhood imaginings of adventures in the frozen north and the grim and determined men of the Yukon and the noble wisdom of wolves. And we both love monsters. The story started to grow right then, for both of us. After dinner, we walked back to the convention hotel, plotting Jack’s adventures. I think, in that moment, we were both twelve years old again. 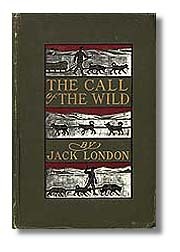 As adults, going back and rereading the works of Jack London, we’ve discovered even greater depth than we had seen as kids, though I believe we both recognized the power of Jack London’s themes even then. I know, I know. We’re the weird things behind the glass museum case. How does it work? We plot together and we talk—a lot. We started with an outline and then one of us starts writing, does the first chapter and sends it to the other. We get on the phone again (well, on Skype) and talk about the chapter, and then what needs to come next, how far the next chapter should take us, how much we should keep to or stray from our outline, and then whoever is next at bat takes the next chapter. And it grows. Like that. It’s The Secret Journeys of Jack London. The first book is The Wild, and that’s out now. VOYA and Booklist love it, and we love them for loving it, because it’s meant a great deal to us. It’s come from a very personal place that collaborations sometimes don’t come from. The second book is The Sea Wolves. We’re starting the third one soon. White Fangs. And yep…vampire polar bears. Maybe some of you still have that curious expression on your faces, wondering how two authors collaborate on a novel together. Maybe for some of you, I haven’t explained it well enough because I haven’t gone into the mechanics of it thoroughly. But, really, it isn’t about mechanics, and when it comes to how two writers can create a shared vision, I think I’ve explained it perfectly. The Princess Bride by William Goldman (Harcourt Brace Jovanovich, 1973) was adapted into a film of the same name in 1987. This video features celebrated comic artist Mike Mignola (Hellboy) and award-winning novelist Christopher Golden, talking their illustrated novel, Baltimore (Random House, 2007). Golden rocks - and his fictional wolf dog, too. I'm grateful for the stories Golden and Lebbon create and share. Thanks for posting this, Cynthia! Strongly agreed, LW! Thanks for chiming in!